Setting Prepared mixed choir or prepared women’s choir. Period of creation 2010-09-26 to 2010-10-09, women’s choir: 2010-12-20 to 22, revision: 2011-07. Duration 5 min (mixed choir) resp. 4 min 15 sec (women’s choir). Commission / occasion Commissioned by the Connect Festival in Malmö (Swe) 2010 and by the IGNM (ISCM) Austria 2011. 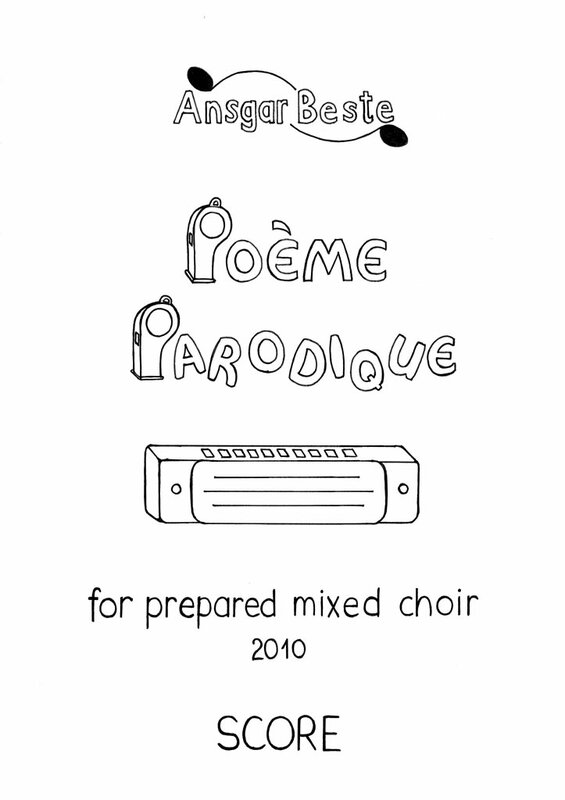 Publisher BabelScores: mixed choir + women’s choir. The main idea behind the piece is a confrontation of two timbral pro­ces­ses within the sound world of a prepared 12-part mixed choir: On the one hand, a poetic lava of slow­ly mov­ing sound masses from harmonica playing sin­g­ers, on the other hand, a parodistic fire­worksof emotional, theatrical and quickly moving in­ter­jec­tions from whistle blowing speakers. Formally, the composition is divided into 8 sections, of which sections 1-4 and 7-8 rep­resent the confrontation between 6 singing and 6 speaking voices, whereas sec­tions 5-6 are entirely sung and form a kind of static climax. The development of den­si­ties runs in the same direction (in both timbral processes) in sections 1 and 8, but in opposite directions in sections 2, 3, 4 and 7. The develop­ment of pitch or brightness proves to be rather static in the spoken layer, but dynamic in the sung counterpart, in which the registers are rising between sections 1 and 4, but falling between sec­tions 7 and 8. 24,24% Winner of the Vocal Music Competition by the IGNM (ISCM) Austria and commission for a vocal work, 8/33 (2011-02). duration: 1 min 30 sec.